Kids love having a chance to build a try new things. That’s just one of the reasons STEM activities for kids are so popular. When you mix the fun of building with the power of rubber bands, you have an exciting hands-on learning activity that kids go nuts over. 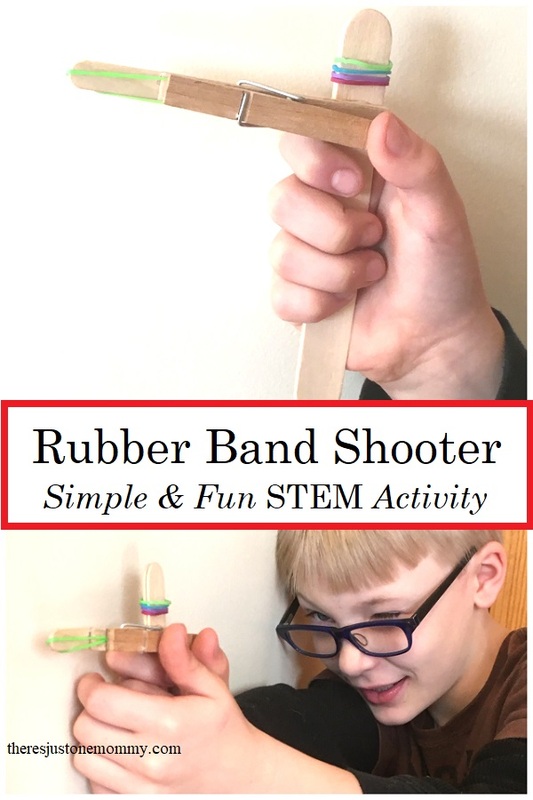 This homemade rubber band shooter STEM activity is fun when the weather has you stuck indoors. If your child loves playing with rubber bands as much as mine do, you may also want to check out our rubber band boat. Affiliate links have been provided below. See my full disclosure for more details. Start by hot gluing the two jumbo craft sticks together, one on top of the other. This will form your handle. Then hot glue the two regular craft sticks together the same way. 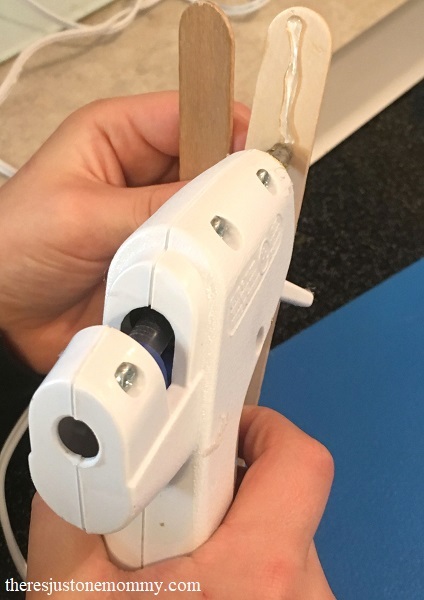 Take the pair of smaller craft sticks and hot glue one end of them an inch from the top of the jumbo craft stick handle so the smaller craft sticks are perpendicular to the jumbo craft sticks. Next, glue the clothes pin on top of the smaller craft sticks so that the end of the clothes pin that you pinch is lined up with the jumbo craft stick handle. 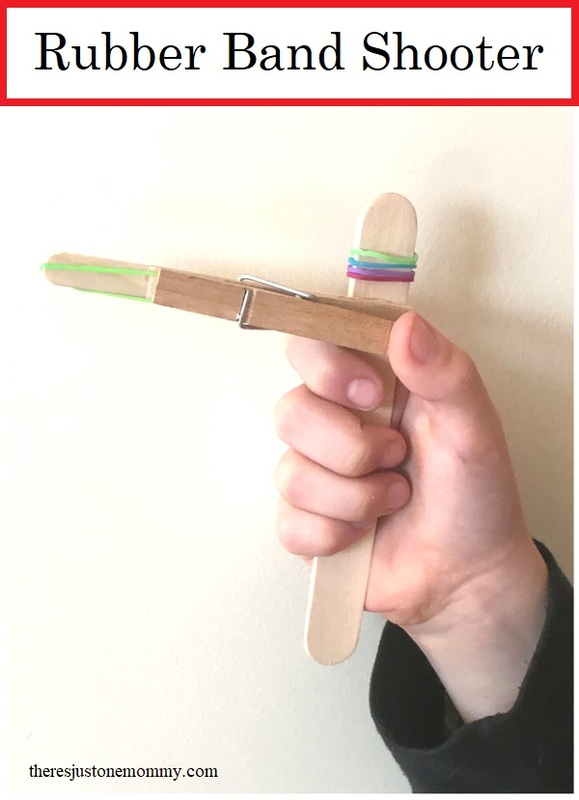 To load your rubber band shooter, pinch open the clothes pin and put one end of a rubber band inside, closing the clothes pin to secure the rubber band in place. Stretch the other end of the rubber band to the front of your shooter and loop it over end of the small craft sticks. The extra inch left at the top of the handle is perfect for storing your mini rubber bands. To shoot, press on the clothes pin to release the rubber band. Remind your child to always aim at a safe target. Although mini rubber bands don’t hurt as much as a larger rubber band, they can still be dangerous. Never aim at pets or people. Empty pop cans make fun targets that make a little “ding” when you hit them. You can also use this rubber band gun for Nerf gun math facts and sight word practice. Want to sneak in a little more learning with this rubber band STEM activity? When the rubber band is stretched it is full of potential energy. When you press the clothes pin that energy changes to kinetic energy as the rubber band flies forward. How far does the rubber band fly? Use a tape measure and record the distance. Can your child make it shoot further? Will changing where the clothes pin is located on the shooter change how far the rubber band goes? Try it! 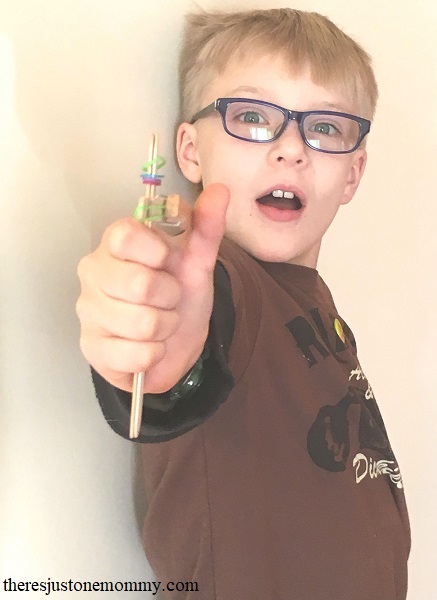 Have your child design and build a new shooter and see how moving the trigger affects the distance. They might just move it further back, so the rubber band has to stretch more. Or, they may choose to glue the clothes pin somewhere entirely different. Let them experiment with how the changes affect how the rubber band moves. 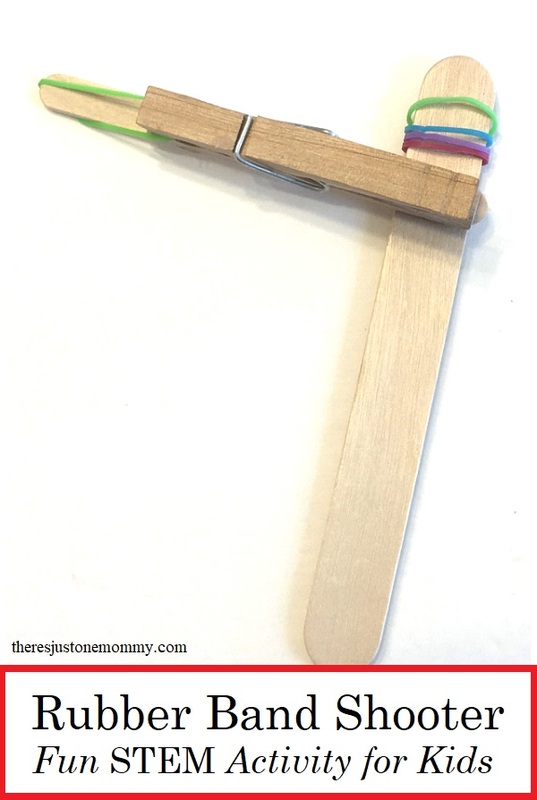 This homemade rubber band shooter STEM activity is lots of fun for elementary kids to explore.